Every year thousands around the globe celebrate and promote tai chi on World Tai Chi & Qigong Day (WTCQGD). This event was founded almost 20 years ago by Bill Douglas, as a way to promote interest in these exercises. And it worked. Every year many schools who participate in this event bring in new students. And I am excited to announce that this may get even better – new research and the release of my book Mindful Exercise: Metarobics, Healing, and the Power of Tai Chi, byYMAA, August 2018, holds promise for attracting even more to these health and life giving arts. As a researcher in the field of health, I am often asked how and why tai chi benefits so many conditions. New research now gives me an answer that goes beyond qi. Qi has a profound and deep history in Traditional Chinese Medicine. But from a Western perspective, saying benefits are from qi can sometimes be a barrier to the promotion of these exercises, particularly among older adults. Targeting new Metarobic concepts related to the physiological effects of these exercises, and how this relates to health and chronic conditions (described below), can result in a dramatic increase in attendance at tai chi events and classes. I found this out at a WTCQGD event in Wisconsin. While working at the University of Wisconsin, Stevens Point, I put out a flyer on the event, which noted my work on the physiological effects and benefits of tai chi for a variety of conditions. This flyer resulted in my being invited to discuss my work during a 30-minute radio show. I was asked questions about Metarobics, and the role of hypoxia (oxygen deficiency) in cancer and many other conditions. And the station began getting calls. They got so many calls, that the station manager cancelled the next show, and I was asked to stay an extra half hour. The impact of my work with Metarobics was tremendous. In prior years, only a few people came to the event, if anyone even showed up. That year, over 70 people came to the event, with a corresponding increase in attendance at local classes. Bill Douglas himself notes of my work: "This book can help open a portal that will in time see (an) increase to 20, 30, or even 60% of Americans using these highly effective tools of tai chi and qigong..."
This tremendous response to a physiological understanding of how and why tai chi and qigong can benefit health also occurred at a talk at 'On Top of the World (OTOW) Communities' in Florida. The director said that typically 10 to 15 people come to these talks. I again targeted health benefits and physiological effects in the description of the talk, and over 130 people showed up. This resulted in a corresponding increase in classes, from one class of 7-8 people, to three classes of 20-30 people. People who know and love tai chi, and understand Chinese principles of qi, need no other reason to do tai chi. But people who are confused about how and why tai chi could benefit anything, need an explanation which makes sense to them. Metarobics seems to do that. Prior to my talk at OTOW, students in the tai chi class had commented on their frustration in trying to get people to join their class. As commented by one student: "People see us and think we are waving our hands around for no reason." My own understanding on Metarobic effects occurred following the change in condition in three of my students with cancer. The most dramatic was Karen, who had been given three weeks to live. Not ready to give up, she came to me, after hearing that tai chi might help. I made her a video that night, and went over it with her until she was comfortable following the 24-Yang style form. Three weeks came and went, and she was still alive. Then three months, and then three years. When she first started, she had been taking five maximum doses of morphine a day for the pain. Within 10 days, she no longer needed the medication. This effect on pain is consistent, as noted in my book and supporting research. I began researching cancer, and found that hypoxia (oxygen deficiency) severely complicates cancer treatment. Knowing that the literal translation of qi in the Chinese/English dictionary is air, or oxygen, I began measuring blood oxygen saturation during tai chi and other exercises. I found that during tai chi and other breath-focused relaxation exercises, blood oxygen saturation increases, while during aerobic exercise it stays the same or drops, depending on intensity. Oxygen diffusion in the tissues also increases, which can be felt as a pleasant tingling in the extremities. Somewhat like what happens when your arm or leg falls asleep and circulation is restored, but pleasant rather than painful. And this was just the beginning. 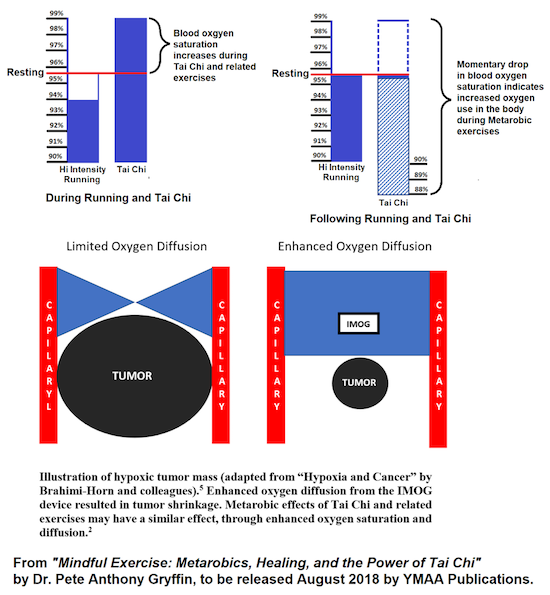 Later studies showed a huge momentary drop (relatively speaking) in oxygen saturation following tai chi, indicating that not only is blood oxygen saturation and diffusion enhanced during tai chi, but that the body is using the oxygen at a much higher rate. This increase would explain the benefits of tai chi for the wide range of conditions complicated by hypoxia, including not only cancer, but also heart, lung and kidney disease, diabetes, arthritis, asthma, Alzheimer's, multiple sclerosis and more. Hypoxia also has an effect on immunity. The studies, along with over 50 case stories, as well as research on a wide range of conditions, will be detailed in my book. Recommendations for maximizing Metarobic effects are also discussed, which can also help with developing and promoting user-friendly, evidence-based classes. These classes can be a great way to introduce people to the depth and wonder of tai chi, and help to popularize these exercises on a wider scale. Metarobic theory can also help to maximize health benefits. In focusing on Metarobic principles in my own practice, symptoms of celiac neuropathy have cleared up, as well as almost all of the white from my hair. A large age spot that appeared on my hand a few years ago also disappeared, indicating potential significant effects on our DNA and telomeres. Telomeres, the end caps on our chromosomes, can also be affected by hypoxia, as discussed in my book. Tai chi may truly be the fountain of youth, and the foundation of health. For more information and regular updates, please "Like" the Metarobics Facebook Page. The term Metarobics is copyrighted, to prevent misuse, and use without permission. Use is granted of Metarobics for education and promotion of tai chi and related arts. If you would like to develop a commercial program, video, book or other medium specifically focused on Metarobics, please contact Dr. P. Anthony Gryffin at: drgryffin@metarobics.org.